Anthropocentric thinking produces fractured ecological perspectives that can perpetuate destructive, wasteful behaviours. Learning to recognise the entangled nature of our everyday relationships with food can encourage ethical ecological thinking and lay the foundations for more sustainable lifestyles. This book analyses ethnographic data gathered from participants in Alternative Food Networks from farmers’ markets to community gardens, agricultural shows and food redistribution services. Drawing on theoretical insights from political ecology, eco-feminism, ecological humanities, human geography and critical food studies, the author demonstrates the sticky and enduring nature of anthropocentric discourses. Chapters in this book experiment with alternative grammars to support and amplify ecologically attuned practices of human and more-than-human togetherness. In times of increasing climate variability, this book calls for alternative ontologies and world-making practices centred on food which encourage agility and adaptability and are shown to be enacted through playful tinkering guided by an ethic of convivial dignity. 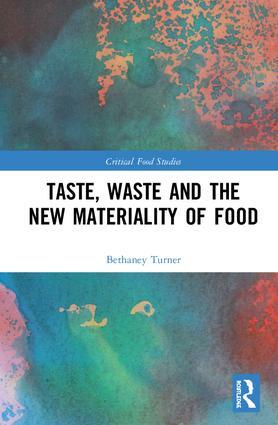 This innovative book offers a valuable insight into food networks and sustainability which will be useful core reading for courses focusing on critical food studies, food ecology and environmental studies. Bethaney Turner is an Assistant Professor in Faculty of Arts and Design at the University of Canberra. Her interdisciplinary research explores how more sustainable urban living behaviours can be developed and fostered in a time of human-induced climate change.